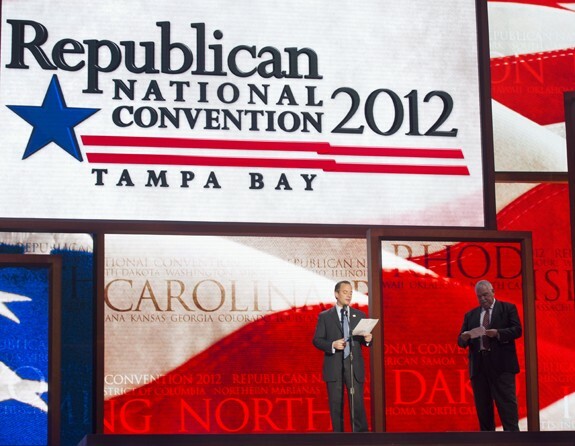 This past week at the Republican National Convention in Tampa, Florida, Republicans have made it an essencial goal to finalize a party platform on the issue of immigration. Whereas Mitt Romney has softened his stance towards undocumented immigrants over the past few months (claiming that he would “consider” passing a Dream Act for undocumented immigrants who have served in the military) in order to pander to Latino voters, the majority of the party does not share his sentiment. 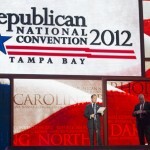 According to the New York Times, the Republican party platform would pass legislation that would “require employers nationwide to verify workers’ legal status and deny federal financing to universities that allow illegal immigrant students to enroll at lower in-state tuition rates.” This is part of the overarching idea of self-deportation that is at the crux of the platform’s ideology. As the Times writes, “Republican delegates hammered out an immigration plank calling for tough border enforcement and opposing ‘any forms of amnesty’ for illegal immigrants, instead endorsing ‘humane procedures to encourage illegal aliens to return home voluntarily,” a policy of self-deportation. '” This self-deportation policy has been met with much criticism over the past months from both politicians and pundits alike. While Latino voters tend to vote democratic, the extent to which they will in this election is still unclear; President Obama has deported more undocumented immigrants than George Bush, and has only recently begun to take actions more sympathetic towards the Latino population. Click here for the entire New York Times article. Everybody now should know the financial consequences of illegal immigration? Just remember that any amnesty this Presidents executive orders enacts is just another giant magnet to draw my foreigners here, looking for a better quality of life or here to scam the American taxpayer and public welfare programs. Whether it’s Obama’s Dream Act, Sanctuary cities, voter fraud, Chain Migration or just plain old illegal immigrants dodging agents at the border, just arriving in America, as an intentional overstay supposed visitor by plane or ferry. Homeland Security Secretary Janet Napolitano states it would be too costly to deport the underestimated 11 million illegal immigrant invaders? Nevertheless her agency stays tight-lipped about the rising hundred billion dollar figure, which is a forcibly extracted tax annually. There are very few issues that are not unrelated with these people who should never be here. However, it all goes back to the inattention of Democrats and Republicans who abused their oath of office, after the 1986 Immigration Control and Reform law. The policies composing of the passage of this bill was dismissed, which was to do with stricter control of business hiring and building a much sturdier fence. The Democrats refused to appropriate the money, so nothing was done? Now we have over 20 million aliens settled here illegally. But why even bother with any tough laws, when there is no real punishment? I am absolutely sure there was no intention from either party to stop cheap labor for Republicans, or illegal vote collections for the Democrats. If Obama wins a second term there is sure to be a comprehensive amnesty, with American taxpayers having even a larger chunk taken from the payroll check. And to be honest I am not even sure of the Republicans agenda, as that tends to flip-flop? But what I am sure about is the plan of the TEA PARTY if they can eject many Democrats and Republican incumbents and replace them. It’s already happening and by infiltrating the Republican Party can politically persist that the “LEGAL WORKFORCE ACT (E-VERIFY) and the BIRTHRIGHT CITIZENSHIP LAW” finds passage enacted. THE MORE TEA PARTY LEADERSHIP IN CONGRESS, THE MORE INFLUENCE? Both bills if passed can insure the removal of illegal aliens from the workplace and stop the smuggling of children into America, to gain citizenship, which has an astronomic financial payout by states. Every American voter has a chance to alter the direction of Americans future. Under Obama resurgence as President in November heads us towards Socialist Republic, that all of our nation will depend on government empowerment. The US counterpart of “freeloaders” who have no integrity would rather live of the rest of us. Judge for yourself by contacting the thousands of local TEA PARTY chapters, or read the conservative manifesto of fighting for our liberties as consigned to us by the founding fathers. The TEA PARTY DOT ORG has all the information you need to decide your vote in less than three months. You might also be concerned with Obama’s citizenship, for other than the irregularities in the birth record there are many questions that remain unanswered. As an individual, I have read some of these bewildering pieces of evidence that have stayed concealed until now. You too can study the facts at the above mentioned website and judge this odd situation. AS FAR AS I AM CONCERNED, I TRUST NEITHER PARTY AS THEY ARE EQUALLY TO BLAME FOR THE MESS AMERICA IS IN. HOWEVER, THE AMALGAMATION INTO THE TEA PARTY COULD HAVE A RADICAL POSITIVE CHANGE FOR EVERY CITIZEN AND GREEN CARD HOLDER.